If you have recently been declared bankrupt and want to rebuild your credit, it is essential that you regularly check your credit report to make sure that all of the details are correct. In reality, we all need a good credit score. This is true for almost any goal involving financing, including buying a home or car. A low credit score can result in high-interest rates and worse terms overall, which means that you’ll pay more just because of your score. Declaring bankruptcy can actually be a good way to help start over and rebuild your credit. You might be wondering, however, if it negatively impacts your credit report and what you can do to minimize the damage. While a bankruptcy on your report isn’t a great outcome, it’s also not one that is insurmountable. If you use the bankruptcy as a chance to rebuild your credit and create a stable financial situation, you will find yourself in a much better situation than you were before filing. With that said, can you remove bankruptcy from credit reports? Well, yes and no. Let’s take a closer look at bankruptcy and how to build a solid credit report. How can I remove bankruptcy from my credit report? To put this simply, you can’t remove a bankruptcy from your report until enough time has passed. They typically stop being reported seven to ten years after they are declared, which means that you should have a “clean” credit report after that time has passed. You don’t have to do anything out of the ordinary to remove the bankruptcy, in other words, because it’s something that typically happens automatically. 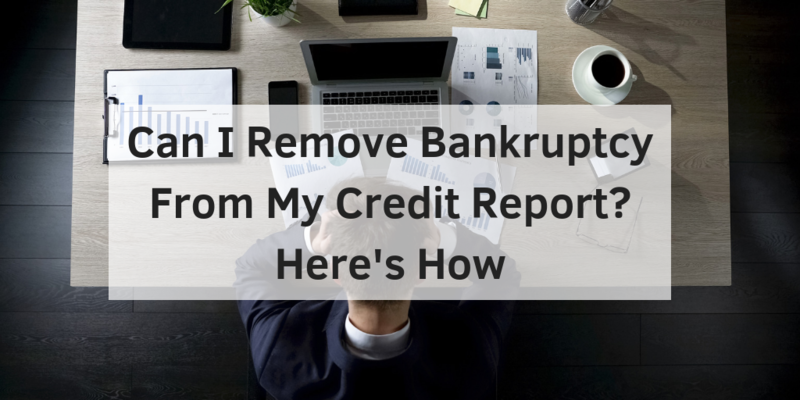 Aside from removing a bankruptcy, there are things you can do to keep tabs on your report and raise your score. Pull your credit report (free once every 12 months). Verify and establish the accuracy of the details and correct them if and when the need arises. Keep in mind that it is your legal right to dispute any and all entries on your report if they are inaccurate. While it is always the case that lenders generally opt to not do business with many people who have had bankruptcies in the past, many do give them the option to take out loans just a month or two after a bankruptcy has been filed. Don’t be tempted. Instead, research debt agencies who are able to work with you without taking advantage of your current situation. When you find one, check their credit guidelines. Also, take into account what interest rate you can afford to pay. Constantly make payments early, if at all possible, but on-time if not. Avoiding making payments late shows lenders that they can be comfortable doing business with you post-bankruptcy. Keep an eye on what you are spending and make it a priority to keep your debt to income ratio low. For more information about how you can remove bankruptcy from your credit report, contact Go Clean Credit to get back on the right track. We have many credit repair programs that are available to help you overcome your credit situation and place you back on the path to financial success. Real credit restoration is not a one size fits all model and we tailor your needs to the right program, but most people can start for just $99 per month.